Yep, the cat’s out of the bag! At least some of the time. I recently lost my home and companion kitty and I’m really hoping this stopover is a short one on the road to a new fur-ever home. 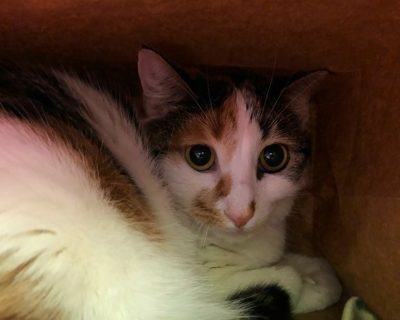 As you can see, I’m a lovely calico with unique coloring and my face is adorable, don’t you agree? I’m very affectionate if you take a moment to coax me to come to you. Come see me in Cat Room A and make me your Valentine for just $14.